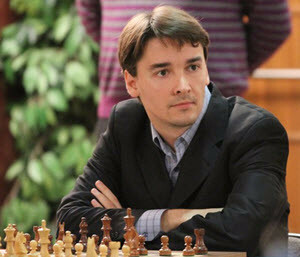 Alexander Morozevich is a Russian chess player known for this attacking playing style and reluctance to play for tie. He often utilizes sharp debutes, e.g. Chigorin’s defence and Albin’s counter gambit. His highest ranking so far is 2788 (second in the world), attained in July 2008. In addition to being successful in traditional chess, Morozevich is also a skilled blindfold player. In 2002, he won the Melody Amber Blindfold Fast Chess Tournament. Alexander Sergeyevich Morozevich was born in Moscow on July 18, 1977. When he was 17 years old, Morozevich won the Lloyds Bank tournament in London with a 9½ out of 10 score. That same year, he also won the Pamplona tournament. .
Alexander Morozevich was a part of the Russian National Team in the 1998, 2000 and 2002 Chess Olympics. He was also a part of the Russian National Team in the European Team Championships of 2003 and 2007, where the team won gold medals, as well as the 2004 European Team Championships where the Russian team took silver. Morozevich won the Melody Amber in 2002. In 2004, 2006 and 2008, he ended on a shared first place in this tournament. Morozevich has won the Biel International Chess Tournament three times: 2003, 2004 and 2006. Morozevich was a World Championship Candidate in 2005 and 2007. In 2014, Morozevich won the Karpov Poikovsky Tournament.